Whether you’re running a 5-star hotel that caters to pop stars or a nightly motel that caters to late-night travelers, your hotel business will face its fair share of risks. And with those risks, comes a need to protect your business and all that comes with it. What Risks Do Hotels Face? Well, in 2011, Tara Kimkee Tan, a former hotel manager at the Standard Hotel in New York City suddenly went into labor during her shift. She gave birth in a guest room at the hotel, and then sued the hotel for $10 million, claiming she was rushed out carelessly by the hotel supervisors after delivery, wasn't offered maternity leave, and was fired four months later. Even something like an unauthorized guest could be fodder for a lawsuit — like when a Starwood Hotel gave an unknown man a key to Wall Street banker Alison Fournier's room, where he later climbed into bed with her. She turned around and sued the company for damages. It's important as a hotel owner to be prepared for these situations, as the hospitality industry faces high profile lawsuits each year. And the only way to properly protect your business is with a proper set of hotel insurance policies. The only way to properly protect your business is with a proper set of hotel insurance policies. Unemployment insurance: This coverage is required by law and is included as part of your state taxes. Once you establish and register your business with your state’s workforce agency and begin paying taxes, your business will be covered. Disability insurance: This coverage is required by law only if your hotel is located in California, Hawaii, New Jersey, New York, Rhode Island, or Puerto Rico. Otherwise, it’s optional. Business insurance: This coverage is necessary to protect your business from extreme financial losses after natural disasters, accidents, and other costly problems you may face in the course of running your hotel. 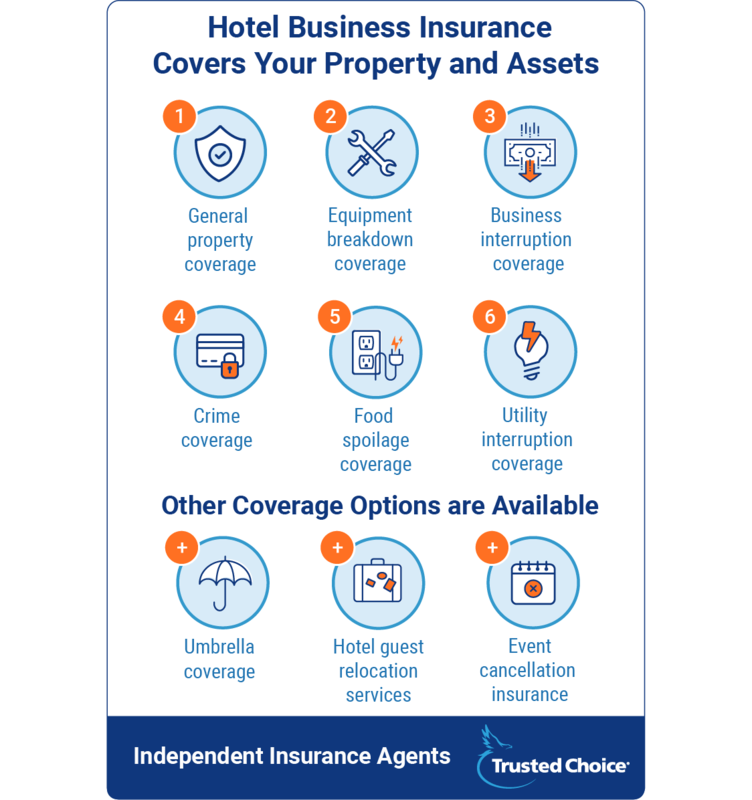 What Is Hotel Business Insurance? Hotel-motel insurance is a very specific type of business insurance policy, or BOP, that’s been tailored to meet the unique coverage needs of your business. There are a number of different coverage options available, which help give you the freedom to build a portfolio of coverages that‘s just right for your specific needs. General liability: This will protect your business from injuries or property damage sustained by guests while on your hotel’s property. Workers compensation: If an employee’s injured on the job, your business is required to cover any resulting medical expenses. Every state has its own workers compensation requirements, but your hotel business insurance can include this coverage to help meet your state’s laws. Commercial auto liability: Many hotels have limo or shuttle service available to cart people around town or to and from the airport. If your hotel owns these vehicles, you’ll want to be sure you have liability coverage that meets your state's minimum requirements. Foodborne illness liability: Many hotels include a restaurant and room service. If the food you serve is contaminated with E. coli, salmonella, or any other foodborne illness and a guest gets sick, this coverage will help protect you from any resulting liability costs. Liquor liability: If your hotel includes a bar or offers alcoholic beverages through room service, you’ll need liquor liability insurance. It protects you if a guest becomes intoxicated due to your negligent service of alcohol and causes property damage or bodily harm to themselves or others. Premises pollution liability: If your hotel becomes contaminated by mold or other airborne pollutants that can sicken guests, you may face liability charges. This insurance will help provide coverage for ensuing medical bills, punitive fees, and cleanup costs. Cyber liability: If your computer and data management system is breached, it can give cyber criminals access to your guests' personal information, including names, addresses, and credit card numbers. If this happens, you could be responsible for providing all affected guests with credit protection services and could face harsh penalties. Cyber liability insurance provides protection from internet-related losses. Employment practices liability: This insurance protects you from losses associated with lawsuits brought against your business by employees alleging harassment or discrimination. General property coverage: Your hotel is filled with furniture, electronics, décor, carpeting, and amenities. If property is lost or damaged due to theft, vandalism, fire, severe weather, or other catastrophic event, this coverage will help compensate you for your losses. Equipment breakdown coverage: An equipment breakdown can have a serious effect on your bottom line. If you have an equipment failure and, say, your heat goes out, you’ll have some unhappy guests, which could lead to substantial revenue loss. A failure of your computer system can cause lost reservations and angry customers. Equipment breakdown coverage will provide funds to repair damage caused by the equipment failure and help make up for lost income due to the covered failure. Business interruption coverage: If a covered event forces you to temporarily close your hotel for repairs, you can rely on business interruption coverage to provide you with sufficient income to help you pay monthly expenses and employee salaries. This coverage is typically limited to one year. Crime coverage: You can protect your hotel from losses stemming from guest and employee theft. If an employee engages in some shady illegal behavior while working at your hotel, this insurance can provide compensation for your losses. Utility interruption coverage: A utility outage can have serious consequences. If there’s no running water, your hotel will need to close its restaurant and may need to move guests to a new location. Utility interruption coverage can provide compensation for any losses accrued due to a sustained utility outage. Umbrella coverage: You may want to consider purchasing an umbrella insurance policy to meet any excess liability claims you may be faced with. This additional coverage works on top of your existing liability policy and can save your business from bankruptcy following a catastrophic event. Hotel guest relocation services: If a problem like a fire or a utility outage forces you to relocate your guests, this insurance coverage will provide you with compensation for the costs associated with moving guests and any losses incurred by your hotel as a result. Event cancellation insurance: Many hotels rely on the income generated by renting out halls and banquet rooms for events. If an event needs to be cancelled due to some sort of covered damage, equipment failure, or power outages, this insurance will cover the associated costs, including lost revenue. Do I Need Hotel Insurance for My Bed and Breakfast? Bed and breakfast establishments and small country inns tend to have slightly different insurance coverage needs. These businesses take in far fewer customers each night and provide different amenities to them. For example, a B and B will typically not offer room service, swimming pools, or fitness centers, but will offer home cooked-meals, lovely scenery, and personalized service. Many insurance companies offer special bed and breakfast insurance policies designed specifically for these smaller businesses, and they come at a lower rate than hotel insurance policies. Our agents will review your needs and help you evaluate which hotel insurance policy makes the most sense. They'll also compare policies and quotes from multiple insurance companies to make sure you have the best protection out there. They'll hook you up — in a comprehensive and affordable way.